James Tissot’s mistress and muse, Kathleen Kelly Newton, died of tuberculosis on November 9, 1882 and was buried in plot 2903A (register no. 043971) in St. Mary’s Roman Catholic Cemetery, Kensal Green, North West London (west of Regent’s Park). [See James Tissot’s garden idyll & Kathleen Newton’s death.] After her funeral on November 14, Tissot returned to Paris after eleven years in England. Tissot had been friends with Dutch-born painter Lawrence Alma-Tadema (1836 – 1912) since 1859, when they met as students in Antwerp. Reunited in London, where Alma-Tadema now lived on the north side of the Regent’s Park with his young wife, Laura Epps (1852 – 1909), the two painters had a falling out in the mid-1870s. 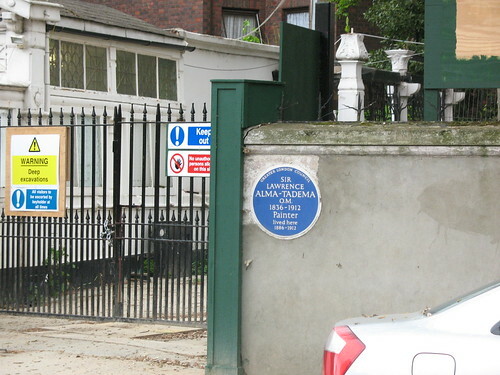 Through an agent, Alma-Tadema purchased James Tissot’s house at 17 (now 44) Grove End Road in St. John’s Wood by 1883, but he could not move in until he sold his home, Townshend House. 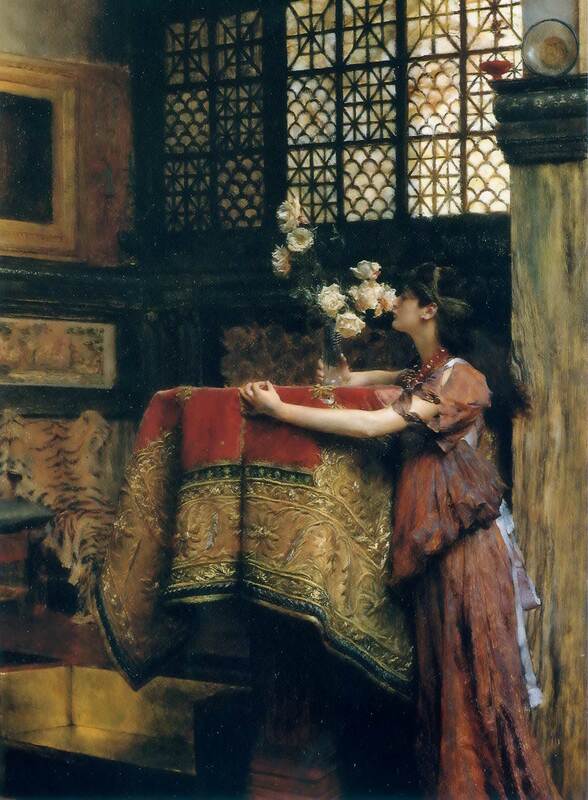 After a two-year wait, Lawrence Alma-Tadema moved into Tissot’s former home on July 17, 1885, and began extensive remodeling. He enlarged and modified Tissot’s Queen Anne villa into an Italianate mansion appropriate for his popular (and expensive) paintings of ancient Rome. Alma-Tadema enhanced the garden and colonnaded pool that Tissot had built with huge classical urns and fountains splashing water over exotic fish. He built a Dutch-style studio for Laura, who also painted, and a three-story studio for himself, capped with a semi-circular dome covered in aluminum, which gave a silvery tone to his paintings. 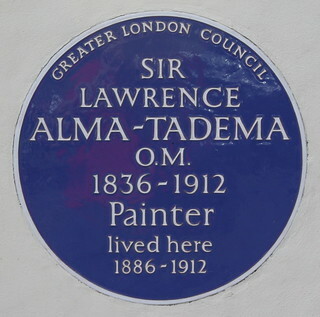 Alma-Tadema painted and renovated his new home while his wife and two daughters lived in Windsor, in the home of a friend who was travelling abroad. His décor included a Japanese room, a Chinese room, and an Arabic room. His family finally moved in on November 17, 1886, and Alma-Tadema and his wife hosted Monday afternoon open houses and lavish Tuesday evening dinners and concerts for friends such as the Prince and Princess of Wales, the composer Tchaikovsky (1840 – 1893), French sculptor Auguste Rodin (1840 – 1917), novelist Henry James (1843 – 1916), French actress Sarah Bernhardt (1844 – 1923), internationally-acclaimed portrait painter John Singer Sargent (1856 – 1925), Polish pianist and composer Ignacy Paderewski (1860 –1941), Italian tenor Enrico Caruso (1873 – 1921) and Winston Churchill (1874 – 1965). James Tissot owned the house at Grove End Road only from 1873 to 1882, while Sir Lawrence Alma-Tadema, a Royal Academician, owned it for nearly thirty years, from 1883 until 1912. The house was converted to apartments in the 1920s and fell into disrepair. During World War II, it was occupied by the Army, then bombed and damaged by fire. Tissot’s cast iron colonnade was torn down in 1947 and replaced with garages. The house was later converted into eleven flats, again fell into disrepair, and was listed on English Heritage’s “at risk” register. The Savage family bought it in the mid-1950s and restored it to a single dwelling in 2003 – with an investment of £5 million GBP. 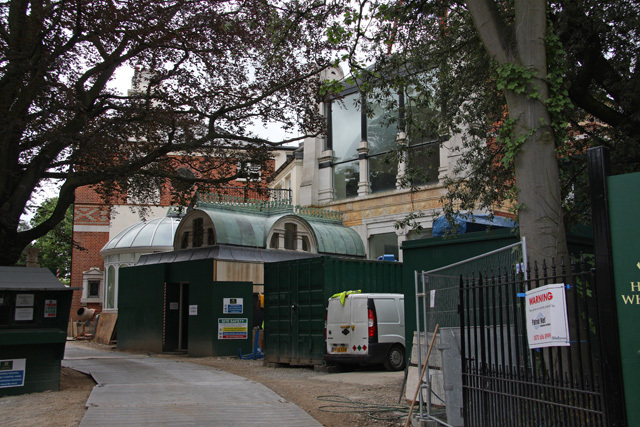 A Grade II listed building since 1987, 44, Grove End Road went on the market in 2006 for £17 million GBP, the same price paid somewhat earlier for a vacant half-acre of land on nearby Avenue Road. Preparing for the gala (c. 1874), by James Tissot. Courtesy of the-athenaeum. Though bathrooms and a kitchen were needed, at an estimated cost of £3 to 4 million GBP, a buyer was found. 44, Grove End Road is now the address of a charitable organization, established in 2006, that works in the U.K. and the Arab world, particularly in Syria, Lebanon and Palestine. Coincidental to the 2006 sale of James Tissot’s former home was the 2006 sale of Preparing for the gala (c. 1874), painted in Tissot’s garden in St. John’s Wood. Preparing for the gala, which was sold at Sotheby’s, New York in 1996 for $1,650,000/ £ 1,090,188, was sold at Christie’s, London in 2006 for $ 2,763,150/£ 1,500,000. © Copyright Lucy Paquette 2013. All rights reserved. (295 pages; ISBN (ePub): 978-0-615-68267-9). NOTE: If you do not have a Kindle e-reader, you may download free Kindle reading apps for PCs, Smartphones, tablets, and the Kindle Cloud Reader to read The Hammock: A novel based on the true story of French painter James Tissot. Read reviews. 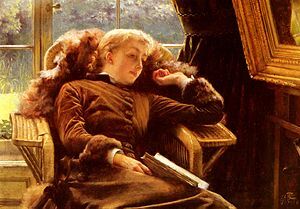 This entry was posted in Art blog, Art History, Impressionists and tagged James Tissot, Kathleen Newton, Laura Epps, Lawrence Alma-Tadema on September 9, 2013 by Lucy Paquette, author of The Hammock: A novel based on the true story of French painter James Tissot.